Mr Bwalya pictured with his lawyer Jack Mwiimbu at KKIA earlier today before flying off to Ndola for the court appearance. The state has entered a nolle prosequi in a case in which UPND leader Hakainde Hichilema and his Vice Geoffrey Bwalya Mwamba were individually charged with seditious practices and jointly charged with unlawful assembly. When the case came up for continued trial in the Luanshya Magistrates Court this morning, one of the state prosecutors announced that the Director of Public Prosecutions had decided to discontinue the case by way of a nolle prosequi. The two were facing one count of offence of unlawful assembly where they are alleged to have convened an unlawful assembly without notifying the regulating officer. This is when they stopped at Luanshya turn off to greet supporters on their way to visit incarcerated UPND officials at Kamfisa state prison. They were also facing two counts of seditious practices for allegedly conspiring to bring into hatred, incite violence, resistance and disobedience to the administration of the elected government of Zambia by using words namely “nga taba mufumishe Matambo, epo ulubuli lwalatampila” (if they don’t release Matambo, fights will break out). The three offences were allegedly committed on 26th September 2016. During trial which as lasted for over a year, the state only called two witnesses who happen to be both PF officials. HH walks to freedom as state enters nolle prosequi in the treason case. Just wasting the precious time of the court and that of the accused. Time to do away with these nolles? Wasting tax payers money again on useless charges. How much do you think was wasted having HH and co-accused in Jail at Jonathan’s pleasure? I am sure the state pays lawyers for all these useless cases. I just wonder if this is just another way to steal our money. These people never learn. In fact they do not care…as long as Jonathan can carry on visiting countries that do not practice democracy. We really really have had enough!!! And HH should come out and tell the nation if these nolle prosequi are part of the deal and if so then the judicial system is being compromised by politicians and it’s not right. I don’t care if this was a deal struck by madam Scotland, if we are advocating for rule of law, then these type of deals undermine this cause. And if HH says this was not part of the deal to release him, then we have all the reasons to be concerned with our judicial system. We need the details of the deal!!! Who is the ONE chief thief in Zambia = ???? BTW, no prizes for guessing the answer to the last question. Goodwill gesture after spending sleeping in dirty, stinking cells and being in state of limbo for nearly 2 years for a case that was going nowhere! I wonder what a bad gesture is! particularly the dynamics pertaining to administration of legal matters versus the need to prioritize the execution of national development country-wide. God bless ECL and the Republic of Zambia. Iwe chimbwi its HH and GBM csusing economic problems in Zambia. It Lungu and you lot leaking his arse who are bleeding my lovely country dry. PF is busy stealing without HH and GBM I can imagine Lungu stealing lots of money. Right now Lungu is most travelled leader per week in whole word . Busy trying to launder the money he is stealing so that he can say he earned all the money he has tbrough travel allowances for nonsensical trips that of no economic value to Zambia. Someone help me – what job does the DPP do in our Judiciary? I thought before the decision to prosecute has been made the DPP’s office would have satisfied itself that they have a winnable case in court. This looks like the DPP’s office is being used by the executive arm of government to harass innocent cityzens and undemocratic clamp down of dissenting views. It’s amazing LAZ is NOT calling out these decisions as an abuse of the judicial process. it is also a waste of resources for the court and the accused to engage counsel , whilst the DPP knows that they will withdraw the case in any case. @Munguya, Right on man!!! That is the point. Frivolous charges dropped just because the head of Amnesty International is coming to Zambia.Its all political I tell ya. Now that JCC has ruled that the Presidential Petition was not heard and Concourt erred to dismiss the Petition on the grounds that 14 days had lapsed. JCC has ruled that Concourt only used 10 days and the remaining 4 days were not used to hear,determine and dispose off the Petition. This means the Petition dismissal was Null and Void.The Petition needs to be heard even though the State will Nolle Prosqui the Petition. Clearly Lungu carried out a Constitutional Coup and is in Power illegally. Lungu will account for these irregularities and illegalities when he finally leaves Power.No wonder Lungu is desperate to rig the 2021 Election and prolong his illegal Rule. HH and GBM must now take the Petition to ICJ becoz they wont get Justice from Lungu controlled Courts. DPP is not the arresting officer but prosecutor, meaning the insurer that will make sure you go to jail. If s/he goes Nolle (Nigerian Nolly wood) believe me you are luck. These two skanks shot down the bill of rights which could’ve seen them enjoying freedom of life. Now they are regretting because the current bill of rights loop holes which doesn’t guarantee them 100%. All these nolles are part of the terms and conditions for his releasal including the dialogue but the skanks have already forgotten. Govt is not disappointed because hh been a wrong doer is bound to find himself on the wrong side of the law anytime and they will clamp him again and Scotland is not coming to bail him out again. CORRECTION BA OVAL HEAD THE WORD IS SKUNK.SKANK IS THE DANCE THE RASTAFARIANS DO TO THEIR MUSIC. This masquerade DPP will go down in history and probably in the Guinness book record as one who entered the highest number of nolles and got paid for doing nothing. The series of nolles entered is the reflection of the calibre of the DPP. A hopeless waste of time and resources for a case that had no merit and they must have known would not see the light of day in the court of law, but still pushed for it. This DPP earned a sack for incompetence a long time ago. But then the conduct is expected as she is complicit in the harassment with the state machinery, proving that the judiciary is not independent of Lungu’s dictates. How so embarrassing! I think she is doing the best she can under the circumstances. She is right to dismiss these cases. There is no merit to them. How does she wake up in the morning…and say she is going to work!! Yes she is going to work on Nolle!!!!!!!!!!!!!!! I am actually happy the State is entering nolle prosequis. I just wish they could do it quicker than the slow pace at which they are being dolled out in the HH and GBM’s cases. Opposition parties have a right to assemble, speak and meet the citizenry whenever they want. It was not right in the first place to charge them such a trumped charge. I believe all their cases are incompetent in law and therefore should be dismissed. u5 and his tribal minions say judicially is is xorrupt. u5 has managed to seperate sp from the rest of Zambia. These Nolle Prosquis are being abused by the State. We need to put a stop to the DPP issuing Nolles like confetti.The DPP should allow the State to misuse them.There is a need to amend the Nolle clause so that there is a Penalty for DPP to enter a Nolle. The State should be required to pay the Defendant’s Legal Fees and punitive damages for entering a Nolle Prosqui. Its getting ridiculous. There are already costs incurred by the taxpayer but noone cares as they are all reckless fooools!! The country has moved on. They got a higher profile as victims. 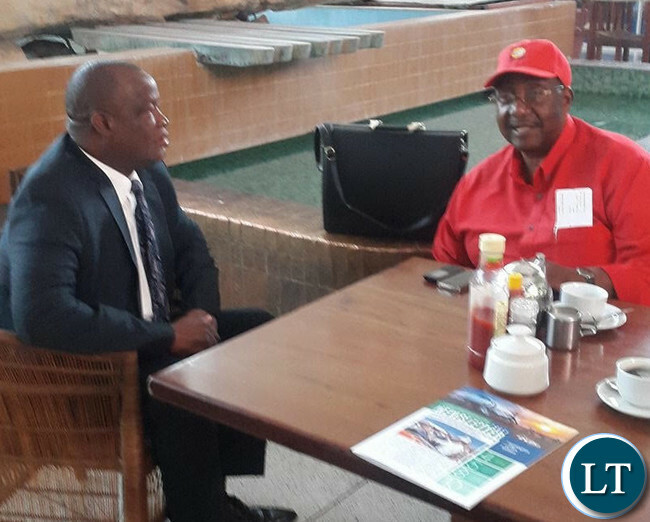 Now, what new UPND, games are next to divert Zambia from peaceful progress? @Mutuloba, a Cree.p like you needs to learn that threats are for kids with no power. I did Military Service and Military Cadet training, to deal with people you. I can find you in seconds as I specialised in Intelligence. Watch yourself. I stand for Zambia against its enemies. Really laughable..Okay since you are all highly trained assasins as you claim …why dont you do us favour and put a contract on each other. as a retired RSM with 25 years of honorable service, I wonder which military academy accepted you for “Cadet training”? As to your specialization in “intelligence”, did your recruiting officer/handler assess your IQ or just measured your arse hole diameter? When is someone going to call out the abuse of power and abuse of the court process by this political stooge called the DPP? In other enlightened countries this incompetent political stooge would have been removed already at the instigation of enlightened citizens. What a backward country this is that has no independent constitutional office bearers who have integrity and conscience. Everyone just dances to the tunes of the illegal president just to prolong their stay in office. Kenya is a thousand years ahead of us when it comes to being progressive and civilised. No wonder Sub-Saharan is worst uncivilized and the poorest on earth with the lowest IQ… it’s a fact and I’m not bashing my own country. A country is judged by the people who rule over it. Ba HH naba GBM mwapusukeni. Muletola nobwapona. Good move by the DPP.also good that the U 5 politician HH keeps on wasting his stolen money paying lawyers every month!!! By 2021 lawyers presenting these two will be rich!!! Patriot abroad for a person who specialised in intelligence i doubt if your trainers would be proud of you now. Intelligent intelligence officers dont identify their training. The DPP is an i.diot…that’s all I can say. Nolle everyday! When will she ever do her job on behalf of the people? We know that she does her job on behalf of Mr. Lungu. How does the legal fraternity in Zambia live with this kind of sh!t? Do they have any aorta of nobility in their profession? Why are they just dwiiii? This abuse of judicial processes by Lungu to fix political opponents has reached truly gutless levels! They must recall how the Public Order Act came back to bite a ‘gianomous’ chunk off Godfrey Miyanda’s backside where it stinks and never shines! This was after he as veep used it to attempt to kill KK and Dr Chongwe in Kabwe!